The Tower of London: Off with his Head! 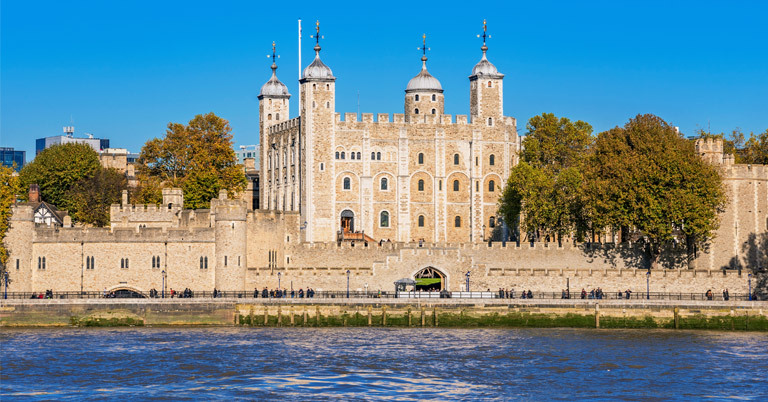 Dating back to the 11th century, the Tower of London is one of the UK’s most popular and historic tourist attractions, attracting around 2.86 million visitors every year. The imposing building that overlooks the north bank of the Thames was once a prison. Constructed in 1078, the castle has been renovated with regular improvements over the years. Today, it houses the Crown Jewels and visitors can enjoy guided tours and historical re-enactments. It wasn’t always such a welcoming place and in years gone by, prisoners held there suffered some horrific and often fatal punishments. In the 16th and 17th centuries, the Tower of London reached its peak when it came to housing prisoners and a common fate was death by beheading. The phrase, “Off with his head!” is one that is often used in popular culture, beginning in the days of Shakespeare’s plays and popping up in Lewis Carroll’s famous 1865 novel, Alice’s Adventures in Wonderland, when the Queen of Hearts shrieks the words many times. For the inmates of the Tower of London, it was a constant fear that this was how their lives would end! The first record of execution by beheading dates from 5th May 1388, when Knight of the Garter Sir Simon Burley was executed during the reign of Richard II for treason during a period of political unrest. The last beheading was recorded in the 18th century, when the Scottish Jacobite Simon Fraser, the 11th Lord Lovat, was executed on 9th April 1747 for committing high treason. The castle’s gory history, dating back almost 1,000 years, is a source of fascination for visitors. Construction began in the early 1070s, under the command of England’s first Norman king, William the Conqueror, following his victory in the Norman Conquests. Conscious of the fact a rebellion was likely, he ordered the construction of the Tower, which would be England’s biggest stone fortress. It dominated the capital’s skyline, standing out on Tower Hill as a constant reminder of his victory. It took around 20 years before it was finally completed, although William lived there while building work continued, from around 1079 until his death in 1087. King Richard lived there from 1189 to 1199, spending £2,881 on refurbishing the Tower. Although this doesn’t sound like a lot of money today, back in the 12th century, it was the equivalent of £2.1 million in modern terms, taking inflation into account. A number of smaller towers were added in the 14th century and the moat was enlarged. The Medieval Tower was the largest concentric castle in England. This meant one ring of defence was built inside a larger one for additional security. The royal accommodation at the Tower became increasingly luxurious over the centuries. Members of the royal family would stay there during times of conflict to protect themselves and their valuables. Arms and armour were stored and tested there until the 1880s. The Chapel Royal was where the royals worshipped and they also had a private zoo with exotic animals, which closed in the late 19th century. The famous prison finally closed in 1952, after having housed some notorious inmates. Executions were common until the 20th century, with hanging being a regular punishment. There were only 11 executions, all by firing squad, between 1914 and 1941 – for spying during both world wars. The last person to be executed there was Josef Jacobs on 15th August 1941. He was shot by a military firing squad on the East Casements rifle range. The 43-year-old was found guilty of being a German spy under the Treachery Act 1940, after being captured when he parachuted into the UK during the Second World War. Prior to this, many high-profile prisoners had met their doom at the Tower of London. Many of them were political prisoners from the highest ranks of society, including Edward Plantagenet, the Earl of Warwick, who was beheaded on 28th November 1499 for treason. Other prisoners executed by beheading included Edmund de la Pole, the 8th Earl of Suffolk, on 4th May 1513 – his “crime” being that he was the Yorkist claimant to the throne. Queen Anne Boleyn, the second wife of King Henry VIII, met her fate on 19th May 1536, after being found guilty of adultery, while Queen Katherine Howard, his fifth wife, was executed on 13th February 1542 on the same charge. In 1952, when the Tower of London ceased being used as a prison, its notorious inmates included the Kray twins, of London gangland fame, who were jailed after they failed to report for their mandatory National Service. Visitors flock to the Tower today to see the 23,578 pieces of opulent jewellery that make up the Crown Jewels, including famous diamonds. Visitors can find out more about the great jewels heist of 1671 and whether the culprits succeeded. Guided tours are available, while the Prisoners’ Exhibition details the jail’s most famous inmates. See the legendary Yeomen of the Guard, better known as Beefeaters, who are the ceremonial guardians of the Tower. Check out Henry VIII’s armour, meet the famous ravens (the trademark of the castle), see the Traitors’ Gate and recoil in horror at the torture chamber in the Lower Wakefield Tower! The Tower of London is open to the public all year round, with longer opening hours from March to October. H&H Van Hire’s minibus hire is a handy means for all members of your party to travel together. Enjoy a pleasant journey and reduce transport costs and parking problems. Please contact us for details of our comfortable and reliable nine, 14 and 17-seater minibuses for group trips… just make sure you don’t get left behind!